Devised to create parking areas and grassy driveways. GREEN PARKING is made entirely from recycled plastic col­lected via recycling bins. This material ensures resistance to decay and to chemicals and chemical fertilizers. GREEN PARKING is available in green, grey and black. It comes in two versions – light and heavy – measuring 40x40x4.0 – with a drainage area of approximately 90%. The light version is suitable for filling with gravel. The product is extremely quick and easy to lay, as each ele­ment is equipped with a special locking system. 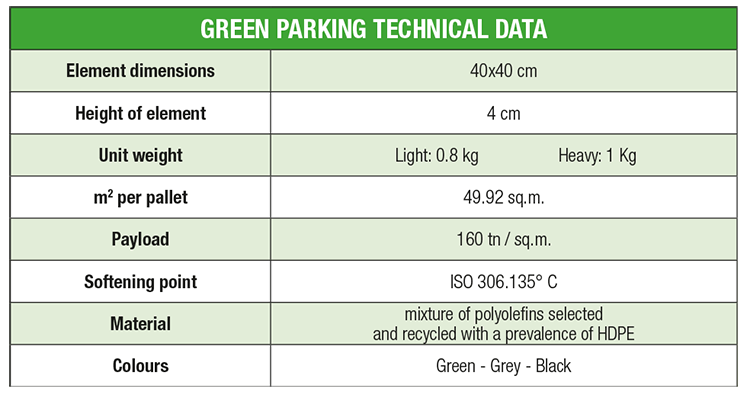 GREEN PARKING’s stability is due to the correct sizing of the substrate, calculated based on the capacity of the ground. 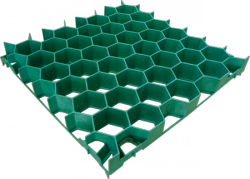 Considering its compact size (40x40x4.0) GREEN PARKING adheres well to the underlying surface by avoiding the classic eleva­tions on the sides of the element when subjected to pressure. GREEN PARKING is equipped with a particular expansion joint which is able to absorb any movement due to temperature variation; as the element is compact in size, movements due to temperature changes are minimal and do not damage the roots of the turf. However, you should leave a gap of 2cm between the element and the outer edge of the surface to be covered. After they have been laid down, the cells should be filled with good quality potting soil and then watered well. After this, top up the soil according to the natural decline of the first layer, and proceed to sow the turf.